I’ve got a smelly Labrador. I call him Old Plum Duff. He can’t keep up for toffee, but he’s brilliant in the rough. He finds my ball in seconds in the most unlikely spots. The course once played around the castle at Inveraray, on the other side of the view shown in this picture. Much in the way the town was relocated by the 3rd Duke of Argyll on aesthetic considerations, the 10th and 11th descendants took a similarly dismal view of the great unwashed playing golf in the Castle grounds. The course remained closed until 19th June 1993 when it was re-opened by the 12th Duke at an appropriate distance from the castle, on the southern side of town. 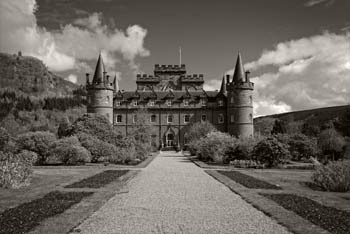 The artist’s impression of the course at the beginning of the Inveraray chapter portrays the Castle overlooking the first – a slightly misleading juxtaposition.